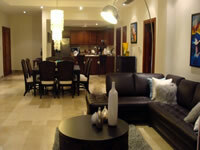 San Juan Vacation Rental - Spectaucular Luxurios and Charming Apartment in Cap Cana, Punta Cana. Our luxury apartment is located in the Aquamarina II complex at the center of the Cap Cana's Marina, the biggest inland marina of the Caribbean with a fine array of elegant gourmet restaurants and specialty boutiques. Once the third stage of the Marina is completed, it will be able to birth 500 yachts. It will be the only full service marina in a 400 kilometer radius between the Turks and Caicos and Puerto Rico, accommodating all types of yachts. The Aquamarina Condominiums offer the best of both worlds - the relaxation and beauty of the beach and the dynamic attractions of a marina. The Marina is fully operational, and has boat slips available for yachts up to 150 feet. The charming canals that are along the Marina will take you back to 17th-century Venice. For your convenience, mini-steamboats will whisk you to wherever you wish to go and they are also called vaporettos like their Italian counterpart. Our luxury apartment is a modern and comforta! ble home away from home!!! Entertaiment Center, 3 LCD HiFi TV, Home Theater w/ Sorround Sound, IPod Dock, and more.. more.. more.. 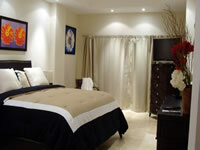 Situated within seven minutes drive from Punta Cana International Airport. Gated and secured location. Yacht Marina with facility for large fishing and cruising boats. Excellent long white sandy private beaches. Fine dining restaurants with a choice of different nationalities and style of fabulous cuisine. First rate golf course designed by Jack Nichlaus with second golf course due to open in 2010. Very special location, the most exclusive resort in the Caribbean. Caleton Beach Club & Spa for the enjoyment of a beautiful beach and great pools. Eco tourism with quad bike tours,surrounded by natural beauty. Clear waters for snorkeling and scuba diving. Air conditioned gymnasium, fully equipped with all latest equipment and physical trainers. Beauty salon for special treatments and hairdressers of the finest quality. 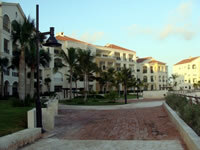 Cap Cana offers a variety of ambiances to choose from. 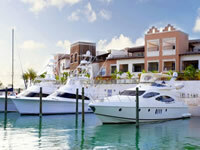 Many activities during the year makes the Marina the heart of Cap Cana, this is t! he place to stay. 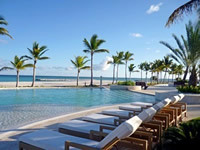 Great Location: Known as the World's New Great Destination, Cap Cana is located on the eastern tip of the Dominican Republic, just ten minutes away from the Punta Cana International Airport (PUJ). One of the busiest airports in the Caribbean Region, with direct flights connections to many mayor cities world-wide including New York, Miami, Atlanta, Madrid, Paris, Frankfurt, Rome, Milan, and Moscow, among others. Gated Community: Cap Cana is an exclusive, luxurious resort and a real estate gated community well known for its ambitious dimensions, impeccable array of services and amenities, and incomparable architectural design that blends perfectly with its Caribbean natural surrounding beauty. Fishing and Beach Paradise: Located only five miles away from one of the most abundant fisheries in the Caribbean and close to the heart of the largest humpback whale sanctuary in the world, fishing season in Cap Cana is every season. Blessed with miles of pristine white sand beaches and 365 days of sunshine; Cap Cana is a magical destination filled with natural beauty which makes it a true and romantic paradise. Golf: Currently, Cap Cana is the home of the Punta Espada Golf Course, designed by Jack Nicklaus and operated by Troon Golf. It was built in 2006 and has been the headquarters to the PGA Champion's Tour since 2008 and listed by Golfweek as the number one golf course in the Caribbean and Mexico. It is also ranked among the best golf course in the world. Its second golf course, "Las Iguanas", is almost complete, and is due to open by the end this year.